This A New York Day tapestry shows the skyline of New York gently illuminated by a warm glow. This modern piece takes the most modern and contemporary subject matter and uses the traditional tapestry form to add a sense of warmth. The perspective is slightly curved to create a wide angled lens appearance. 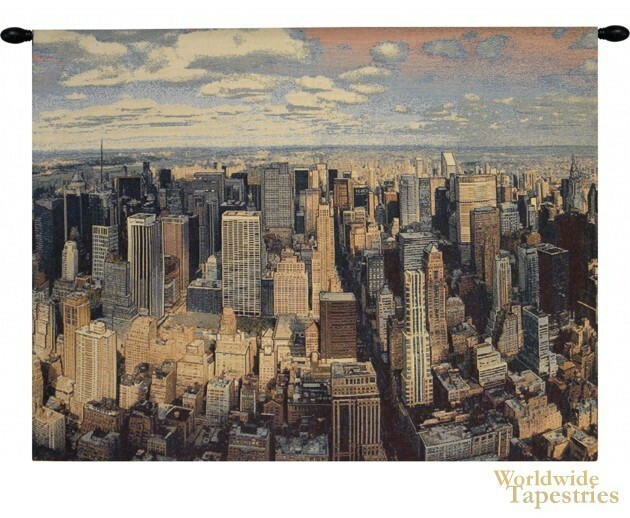 This A New York Day tapestry is backed with a lining and a tunnel for easy hanging. Note: tapestry rods and tassels, where pictured, are not included in the price.